The RockIT Science Celebration held on the last day of the conference. On Tuesday, October 2nd, I left New Hampshire to attend The Grace Hopper Celebration of Women in Computing. Although this was not my first trip to Baltimore, the trip marked my first technology conference, which ended up being just as memorable as I had expected. When asked recently what the best part of the conference was, I could not make an immediate answer. Of course, there were the small things–before even arriving in Baltimore I already had all three days of my trip planned out with the Grace Hopper Celebration mobile app, a useful tool for making schedules and exchanging contact information which really showed off the programming skills of the people involved. Everything was very well-organized, and every event that I attended ran smoothly and on time. The line for registration moved quickly, and even at its longest, one could expect to get their badge in half the time that it would take to get a cup of coffee at the Starbucks nearby. The keynote speakers were fantastic, particularly Nora Denzel who spoke on Thursday morning. The sessions held covered a large variety of topics ranging from very general ideas that anyone could relate to, to very specific focuses that I had never heard of, but each session was very informative and usually got their participants involved. Whether you were an undergrad, completing the last year of your PhD, or already working, there was something for everyone. The goodies given out by companies when picking up your badge and at the career fair and were very cool–some highlights include a bar of chocolate from Microsoft decorated with the Windows Phone, and an I ❤ Clean Code screen cleaner from AAC. As important as all these things were for creating a great conference, however, the attendees were what really made this such a memorable experience. Every person I spoke with was friendly and professional, and no matter who they were or what their background was, they were all in their own way inspiring. I had more great conversations than I can count, and found that even if I missed a session because it was filled to capacity, I could more than compensate for this by just joining in on a conversation with the people around me. I spent hours speaking with professionals in the industry and other undergrads about working in the computer industry and how to find a career, and in a way, I learned much more from these spontaneous conversations than I did from the seminars that had been planned out long beforehand. No matter what profession you are, I strongly suggest that you attend a conference that surrounds you with people who are similar to you at least once. Don’t wait until you’re already out of school if you can help it–there’s no better way to reassure yourself that your degree is worthwhile than to meet people who have already found success and happiness in the career you want to pursue. UNH Manchester faculty, staff, and students support the city of Manchester and the region through their research, community service, and scholarly engagement. Many are active participants in their fields at the regional, national, and international levels. They keep programs and courses current with their ongoing research and service. Mihaela Sabin, associate professor and coordinator of the Computing Technology program, co-presented at the annual National Outreach Scholarship Conference in Lansing, MI in October. Her session was titled, “Defining a 21st Century Community-Engaged Research University”. 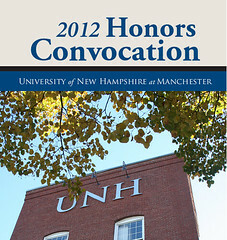 This session explored the decade-long institutional change process that UNH undertook to move the University from a public service, one-way approach to its public, more two-way, mutually beneficial, collaborative approach which now characterizes its institutional culture, scholarship and partnerships. Professor Sabin teaches undergraduate courses in programming, object-oriented design, databases, and web development. Sabin participated in the Special Interest Group in Information Technology Education (SIGITE) Conference in October, held at the U.S. Military Academy in West Point, NY. She presented a paper entitled, “Free and Open Source Software Development of IT Systems,” and served on the panel: “Free and Open Source Software in Computing Education” with two colleagues from Rochester Institute of Technology, Rochester, NY and Muhlenberg College, Allentown, PA. In December she will offer the workshop “Computational Thinking with Games and Simulations using Greenfoot” at the Christa McAuliffe Technology Conference in Manchester at the Radisson Hotel and Expo Center of New Hampshire. The workshop is aimed at middle- and high-school teachers of introductory programming. Professor Sabin teaches undergraduate courses in programming, object-oriented design, databases, and web development.